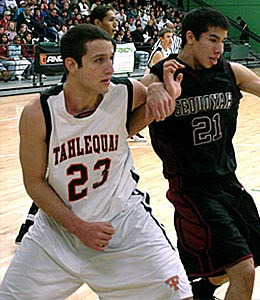 The Bobcats are recruiting 6-7 230lb Matt Qualls of Tahlequah high school in Oklahoma. I knew the Bobcat’s were recruiting Matt last fall but given the way his senior season was going I was figuring that he may be getting some looks from mid majors this spring. I have just heard that he has narrowed his list Montana State, Northern Arizona, and Stephen F. Austin. Matt is a coach’s son and as I understand it now, his father want him signing a letter of intent until the late period. Matt just finished up his senior season with eye popping 23.5 points, 14 rebounds, 3.5 blocks, 2 assist and 2 steals a game while shooting 68% from the field. His points, rebounding and blocks were top in Oklahoma this year. Quallis was a model of consistency shooting under 50% in only 3 games this winter (45%, 44% and 33% games). He went perfect from the field twice (12 for 12 both games) this season, had some huge games scoring 38 points in two games. He pulled down 11 or more rebounds in every game this season. High school career totals of 2,123 points and 1,291 rebounds. 5A MVP, State tourney all star team, Oklahoma All-State first team. As I said before Quall is a coach’s son, and is best described as an old school post player. A beast inside, he has great fundamentals, and a very high basketball IQ. He takes what the defense gives him. He can post you up inside and power over, or take it out to about 12-15 feet. He is a power player who does not mind getting physical, and will not be shooting 3 pointers. When tripled team he can hit the open man. He runs the floor well, great hands, and a decent athlete. I think he could make an impact in the Big Sky as a freshman.